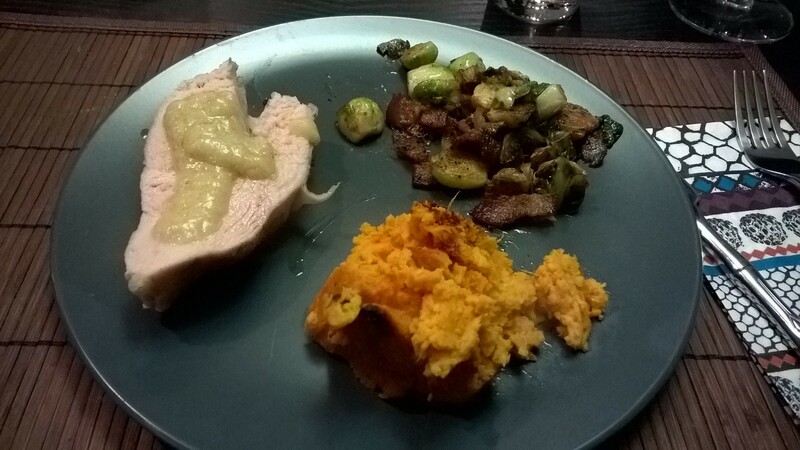 Thanksgiving is in a few weeks so last night we had a “dry run” where I tested some new recipes. This recipe is a modified version of one I found online, mostly I removed all the sugar from the original recipe, swapped our real milk for coconut milk, and made it a bit thicker. I can’t imagine how sweet the original recipe was, but this one is just the prefect amount of sweetness. Enjoy! In a separate bowl beat the eggs together with the coconut milk. Stir in the coconut if using it. Slowly mix the egg mixture into the sweet potatoes. The ending result should be fairly soupy. Butter a baking pan (8×8 or larger), and add the sweet potatoes. Top with the remaining butter. Bake at 400 degrees for about 45 minutes, until the top starts to become golden. This broccoli has become a staple in my house, we make it at least once a week, and no matter how much gets made there is never any leftover. You don’t have to make it with all the ingredients, for instance sometimes we realize we don’t have cheese or lemon and make it with just garlic. Or make it with out garlic and just lemon, it’s really versatile. My quick cheat for when I am in a rush is buying a package of pre-cut broccoli at Whole Foods and pairing this with a roasted chicken, a fast yet wonderful meal! Place oven rack on second slot down from broiler (ie, about 1/3 of the space from the top of the oven) and turn on broiler. After 5 minutes remove baking sheet from the oven and flip the broccoli. Return baking sheet to the oven. Repeat this process every 5-7 min until broccoli is crispy and brown on the outer portions. Gather broccoli in a pile in the middle of the tray. Grate Parmesan on top of pile (about 3-4T worth. )* Zest about half the lemon peel onto the pile. Toss so that the lemon and Parmesan are incorporated. 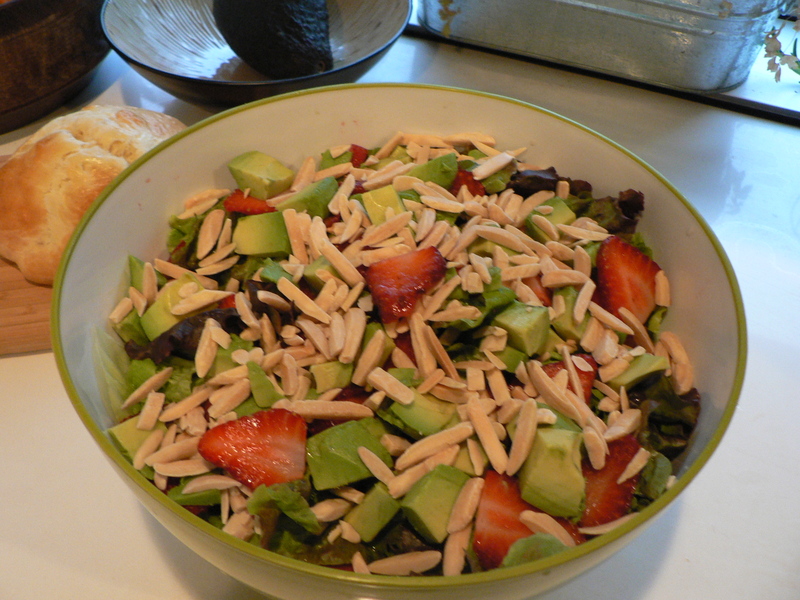 The photo below is the salad without the dressing, I usually serve the dressing separately so that people can decide how much they want. Also serving the dressing separately makes it easier to serve this the next day as leftovers since salad that sits with dressing is not as appealing. Once you make your own humus you will never go back to the store-bought stuff, it’s far too expensive and not as fresh and delicious! 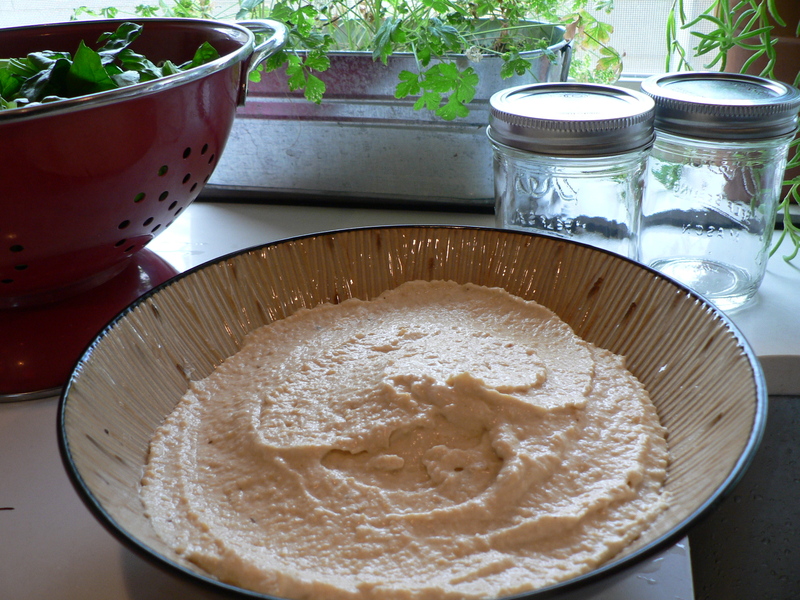 Humus is very inexpensive and super easy to make, plus it pleases a crowd. This humus has a light roasted garlic flavor, if you want a more intense flavor add more roasted garlic, for plain humus omit the roasted garlic, you could also replace the garlic with roasted red peppers or roasted jalapenos. Set oven to broil. Peal 6 of the garlic cloves, place on baking sheet and broil for about 10 minutes (or until golden brown). Once finished set aside to cool. Peal and smash the remaining garlic. Combine all ingredients (except for chickpea liquid) in food processor. Turn on and process until smooth. The humus will be grainy at first, add reserved chickpea liquid, about 1/8th of a cup at a time, until it reaches a smooth consistency. For the past year or so I’ve been trying to locally and in season, I have to admit my weekly Full Circle Farm weekly fruit and vegetable box helps. It also provides a great challenge to find new recipes, especially in the winter when there are not many types of locally grown veggies. 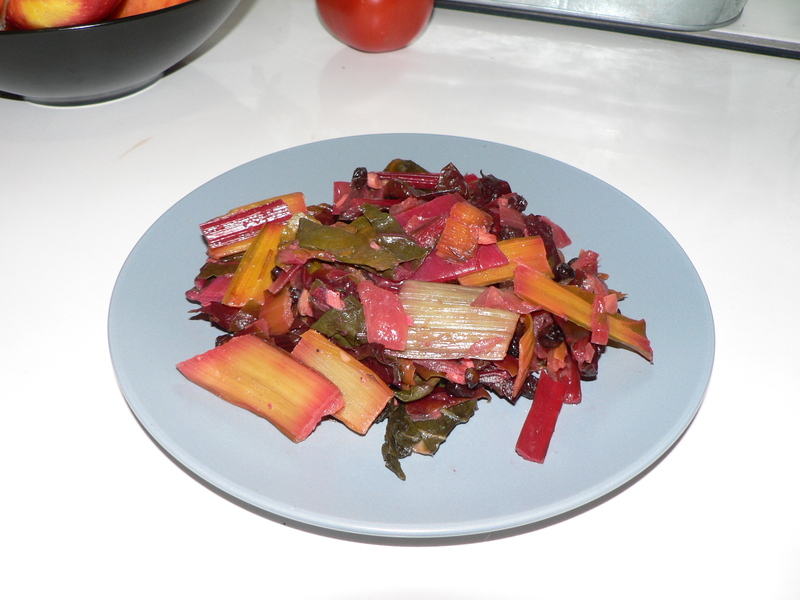 Swiss chard is one of those vegetables I get almost every week for seemingly months on end, and this is one of may favorite low work recipes that’s tastes delicious and is pretty easy to make after a long day at work when I just want to get home and eat something nutritious. I found this recipe in Bon Appetit magazine, but have adapted it, cutting out the radicchio and pine nuts (mostly because I didn’t have them when I first made this recipe) and adding more of the much-loved garlic. Cut the ribs (stalks) from the chard, then cut up into 1 inch pieces. Put aside. Slice leafs into 1 inch strips and then again into about 1 inch squares. Add onion and garlic, cook until onion is tender, about 5 minutes. Add chard ribs and cook until tender, about 6 minutes. Add vinegar and currants, season with salt pepper and more currants.